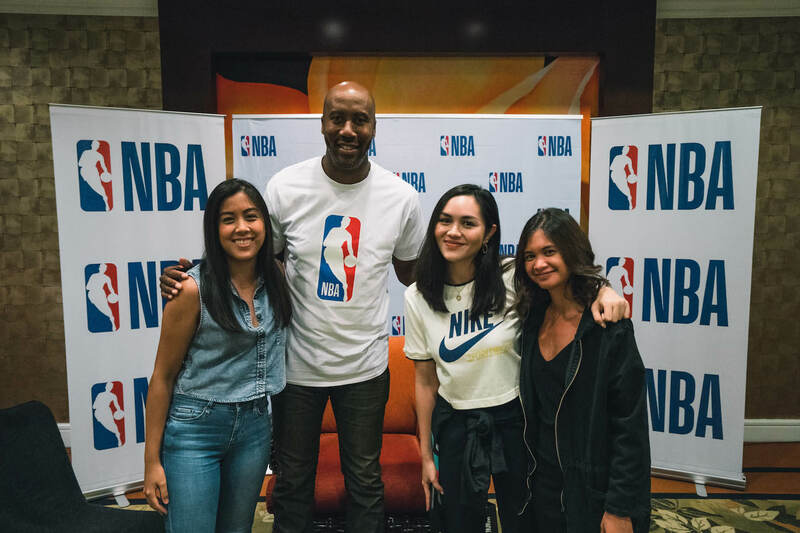 One of the best defenders to ever play in the game is in the Philippines. 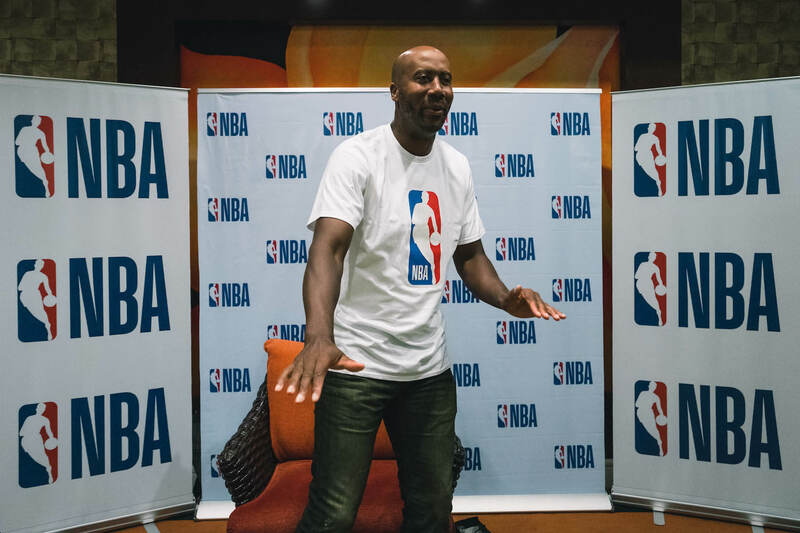 Bruce Bowen is here to watch the first two games of the 2018 NBA Finals with the fans, and conduct a basketball clinic for select boys and girls. 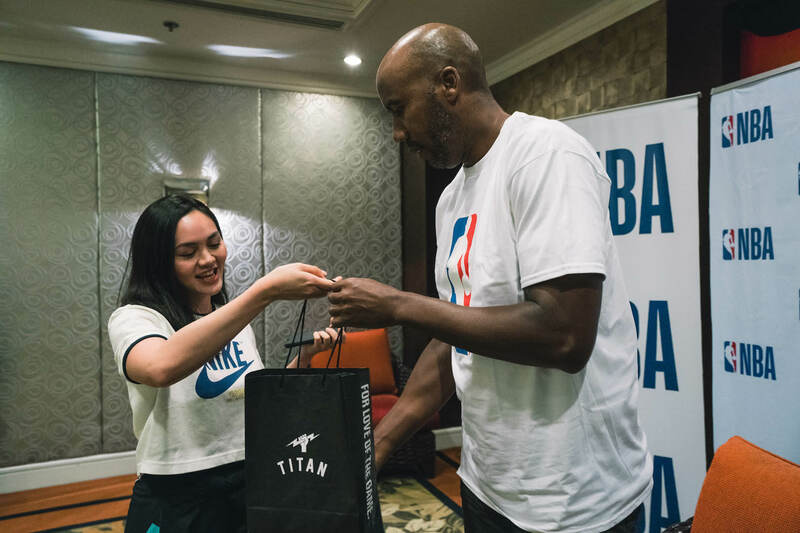 But before the San Antonio legend got down to business, the SLAM PH Team, had the opportunity to welcome him to Manila. 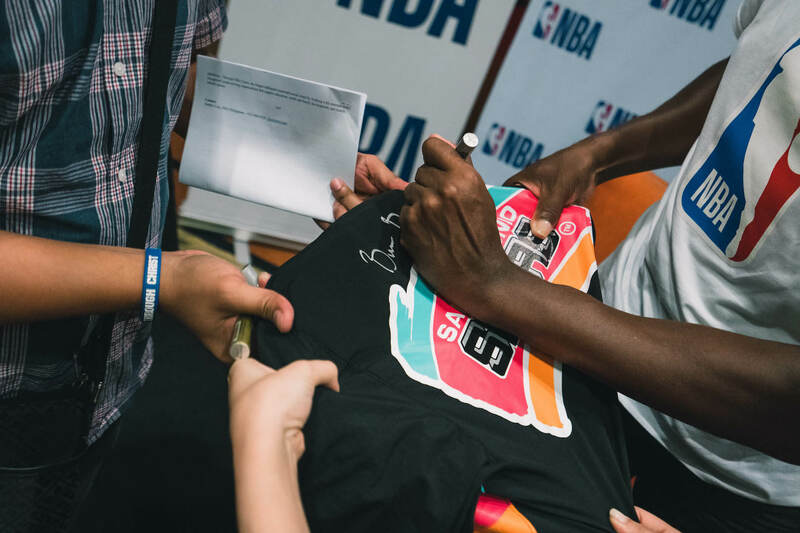 Being the Spurs legend that he is, the entourage was composed mostly of #SLAMFam Spurs fans who were ready to swarm meet an iconic player from their favorite team in person. Mind you, it took a lot of guts for them to make this meet-up happen. I mean, how would they explain their simultaneous, four-hour long lunch breaks once they head back to the office? But there are times when you just have to do what you gotta do, and think about the consequences later. You only live once, after all. One of those times was this. A memo from the boss is worth it, in exchange for a once-in-a-lifetime chance to interact with Bruce. They grabbed their YOLO moment. 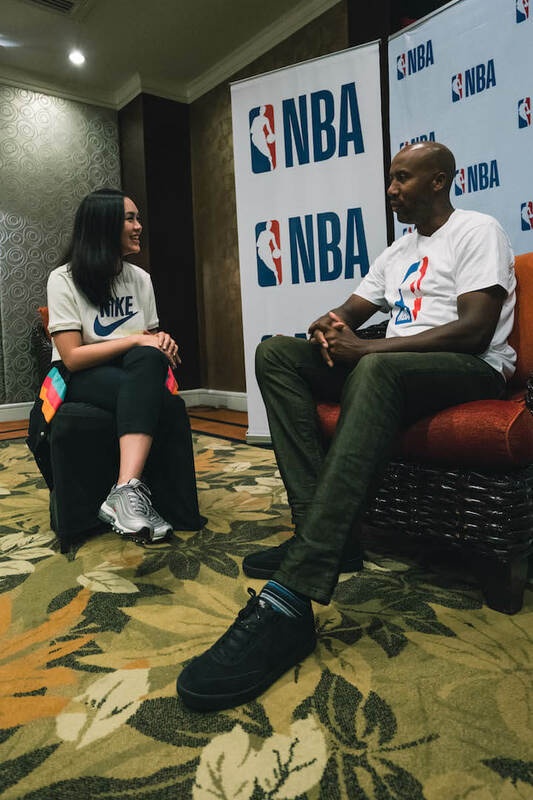 Here’s Bea Fabregas’ one-on-one interview with Bruce Bowen. Bea Fabregas (SLAM PH): Welcome to the Philippines and I know that you talked to a lot of media earlier. It’s only been yesterday, it’s only been a short amount of time. But I know you also heard that we love talking basketball so much. How has Manila treated you so far? Bruce Bowen (BB): Oh, it’s treated me fantastic. It’s always difficult when you stick out as a sore thumb, but I think what makes it better is that there is a genuine love centered for the game of basketball. Looking at following, 6.7 million followers of the game when it comes to the NBA being played, largest number outside the US. I’m blown away by that and the fact that you do have such passionate fans. I was in San Diego and I was having lunch. There was a guy, he’s from Philippines. He’s talking about how much of a fanatic his daughter was. SLAM PH: Like crazy level? SLAM PH: We flew to San Antonio. I flew there March. That’s where I got my media credentials. So I was in a room with Pop for the pre-game. I’ve never been so scared and so happy at the same time. It’s a very confusing moment for me. SLAM PH: Yeah! But anyway, it’s not about me and my love for the Spurs. But moving on, we were talking about all the fans here in the Philippines, and you’re here for the NBA Finals. You’re gonna get to meet some of them and watch the Finals with them. I vividly remember the Spurs going up against LeBron, and a very young LeBron at that time. Now in 2018, what can you say about the kind of player that he is, and just throughout the career, his longevity, his consistency? BB: I think it’s more of the fact that he’s consistently improving. And it’s hard to improve continuously but I think there comes a moment in everyone’s career that you have to look in the mirror and look at your weaknesses. I think that’s something that he’s done. And it’s not that you necessarily become a master at where you’re once weak. But I think to become more comfortable where you’re once weak. So he’s become more comfortable at the leadership role, understanding when to takeover, understanding how important his presence on the floor is. And it is really huge when it comes to taking a younger team that’s very inexperienced. You have three guys there that they got in a trade: Clarkson, Hood and Nance, guys that have never been in this environment before, but in a losing environment. It’s hard to get guys to understand the thought process of a winning environment. It takes discipline. It takes process of not taking things off in practice. SLAM PH: And you know, we’re talking about the best player in the world. And you were on defense on LeBron a lot. So what are some of your go-to secrets? BB: My secret was I was a older and I knew a lot more than him at that time. He’s young, and I have no problem with that. He was such a physical specimen. He was 6’8, 260 (pounds), fast as a point guard. It was more about understanding what his strengths were. His strength at that time was seeing the court. He was really good. He wasn’t a shooter. He wasn’t the shooter that he is now. And he wasn’t a guy who understood the moments of the game. I think he got a chance to learn those types of situations when he went to Miami. So when he got to Miami, he was under the tutelage of Erik Spoelstra and Pat Riley. There, he was able to become more than just what he was in Cleveland. Able to grow. Obviously he grew with four trips to the finals. But even in those trips to the finals, he was able to learn certain things. First year, I think that was a tremendous growing moment for him because that’s when it didn’t work in the Finals against Dallas. And during the summer, they became his team. So, he understood that even though he had relationships with Udonis and D-Wade, he didn’t wanna step on toes, he had to step on toes in order to become what he is today. SLAM PH: Like, that next level. BB: That next level. So now, he’s playing at that level where in Miami, he’s been going for. SLAM PH: Yeah. I gotta ask you though. The Warriors have an extremely talented roster, but we see LeBron coming up with things that’s so consistent. So who do you got for, who’s gonna take it all? BB: Who’s gonna take it all? SLAM PH: According to Bruce Bowen. BB: According to Bruce Bowen! [chuckles] I think Golden State’s gonna win it all. That’s easy for me to say because I always go with the winner in the past. But look at the dynamics Golden State has. They have three individuals that play very well behind the three-point line: Klay Thompson, Steph Curry and Kevin Durant. They’re very good behind the three-point line. But what makes them more special is their movement without the basketball. Lot of times, people are like, “Well you gotta defend them when they get the ball.” Well, you have to defend them when they don’t have the ball because they move so well, especially Steph. Taking those different things away: who are you gonna live with shooting those threes? That’s the thing and you can’t allow them to have, they’re very good at that. So, you can’t allow the whole three-point shot no matter what. As soon as Steph gets on the floor, you gotta have somebody with him. Kevin Durant as well. They’re making two-point shots, so be it. At least they’re not threes. SLAM PH: There you go. Okay, so, we’re gonna take a break from the NBA Finals for a little bit. You are also here doing basketball clinic, of course. And you just did a TED talk which I feel bad that I missed. I wish I witnessed that. But I mean, how important is this for you, this new role? being able to influence the next generation and still do what you love but at the same time be such a great influence at that aspect? BB: Well, I really think absolute for is the vision. What we’re gonna be able to do as far as globalization of the NBA brand. It started with Adam continuously edging David Stern, “This is where we should go, this is what we should do.” But when it comes to kids, Whitney Houston had that song, “I believe the children are our future. Teach them well and let them lead the way.” And so if they can see an NBA guy coming back or coming to their country and giving them the time to interact with them, something they enjoy doing, I think it only encourages them to say, “You know what, I can’t wait ’til I can do something like that.” And it becomes a recycling situation. Maybe my kids will see someone from the Philippines come out to the US one day and give this emphatic speech about passion and drive, desire to want to be better, whatever it is. They’re doing something that will be going that way. I consider it an honor to be here on behalf of the NBA because of what the NBA could give to basketball. So if I can give just a piece of that to someone, if I can reach two kids that we come across, then I’ve done a piece of job as far as reaching someone. To me, it’s the joy of being around kids, it’s the joy of seeing their faces, it’s the joy of seeing uninterrupted love. It’s not about what they can get out. It’s about what we’re able to get to them and allow them to continue to nurture whatever it is that we’re giving. SLAM PH: We don’t have a lot of time. So my last question—you have to indulge me because I am a Spurs fan and I’m allowed to talk about this. So, obviously, Tim Duncan, since he retired, just buried to himself and is more “mind his own business” guy. And I know you’re like, good friends. So I wanna know: how do you guys check up on each other? Do you call him? Does she call you? BB: When I call him, it goes straight to his voicemail. He doesn’t wanna talk. BB: Yeah. He’ll text you back: “What do you want?” What kind of man does that? I wanna talk to you, Tim! BB: Yeah. I hope he will! I hope he will. But now, because we’re both retired now, and even when he was playing, you know, you give guys the space. You know because at that time I was working with ESPN. I don’t want him to feel like: “Oh, he’s trying to get some scoop!” That was not the case for me. But now, we are too old. We have to watch what we eat. It’s no fun! SLAM PH: I would love to be up there eating the salad with you guys. BB: It’s because you like salad! We used to eat steaks! We would eat mac ‘n cheese and we’d go out there and run and all. Now? I’m not doing so much running now. SLAM PH: Absolute pleasure. I think that’s all the time we have. But thank you so much. It’s such an honor to meet you.